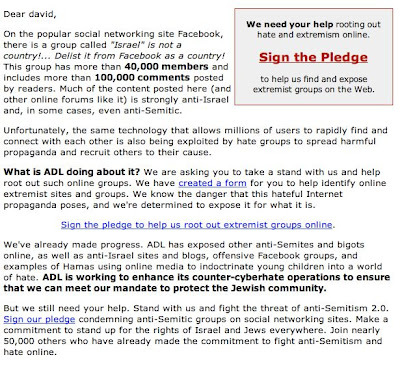 After being on the problem for over 2 years, the JIDF is happy to see ADL take some sort of stand about the problems here on the web. They "created a form" and want you to fill it out. This is the ADL "in action." We're not sure why exactly, but with our knowledge of how the Jewish Establishment works, it is most likely to collect information from you in order to hit you up for a donation in the future, so they can continue (with their $50 million budget) to urge that Jews should give up our Land to the terrorists. Thank you, Abe, and the ADL! The JIDF takes issue with many of the ADL's stands, has problems with how much of their budget gets squandered on administrative costs, and wonders if they don't push too much of a secular progressive liberal agenda. We don't like those types of agendas here at the JIDF. We also do not appreciate the ADL's defamation of Rabbi Meir Kahane, Zt'l. Listen---if it's legit, we celebrate their effort. 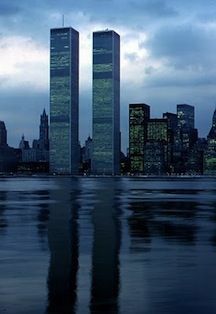 But in light of all their stances and general misguidance, compounded by the fact that they are SO late to the "party" here, we question their general effectiveness in fighting these trends. However, it is somewhat nice to see the Jewish Establishment "wake up." 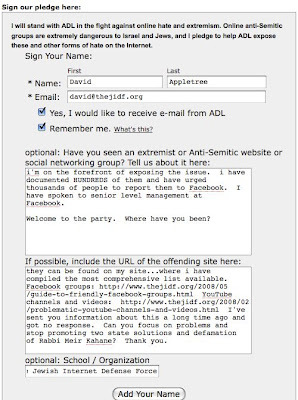 It's a shame that they probably won't be thanking the thousands of us who have already been in tune w/ the issues and have been trying to do something about it long before the ADL officially "got involved" (by asking you to fill out a form) today. Fill out the form, see what sort of course of action they actually suggest----or see if you don't just get hit up for donations.